Since I began sewing, a lot of people - readers of my blog and real life friends - have shown an interest in taking it up themselves and have asked me how to get started. We're at that time of year when many of us are itching to try something new, so I thought it'd be good to answer some of those questions I get here, to give anyone tempted to take up sewing a few tips and a hearty dose of encouragement to get started. Alas, this won't be a tutorial on the practicalities of using a sewing machine. Update! 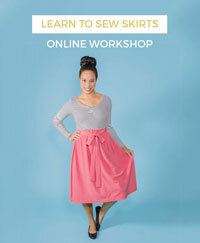 I've now started posting practical tutorials on using a sewing machine - check out the Learn to Sew series. "I hated sewing at school... is it difficult?" I hear the same story so often and it saddens me every time - the scary home economics teacher standing over the child's shoulder, screaming at them for the tiniest mistake, terrifying them so they never get the hang of threading a machine, let alone discover the pleasures that sewing brings. Maybe it was a blessing that I was never taught sewing at school so I wasn't put off at an early age. I want to shout it from the rooftops - "SEWING IS FUN!" The most difficult part is learning to thread the machine, but really it's like tying your shoe laces - once you've got your head round that (see next question) and practised a few times it becomes second nature. 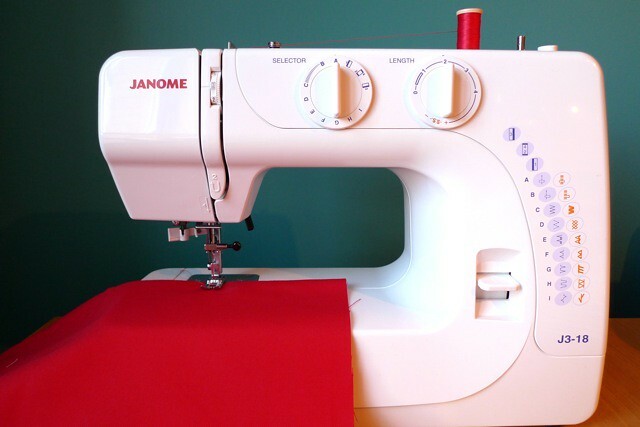 After that, sewing can be as easy or as difficult as you like, depending on the projects and techniques that you choose to tackle. So you can take it at your own pace, starting with easy projects, upping the stakes gradually with more challenging techniques when you feel ready for it. There's always something new to learn, so it never gets boring, just more rewarding - that's the beauty of it! "Does sewing your own clothes save you money?" Not necessarily. On a single project I could spend £10 - £40 on fabric, £4 on thread, £5 on buttons, £1 or £2 on a zipper, and sometimes you need extras like bias tape, lace, linings... Having said that, you can get lucky and find cheap fabric and buttons that match your project at charity shops, markets and independent haberdashers. You can also upcycle things you don't wear in your closet... or even old bed sheets! No matter what you spend on making a dress, you'll treasure it forever. And don't forget that you're not only paying for clothes, you're paying for your hobby at the same time (trust me, once you get the sewing bug, you won't be spending so much money down the pub or on entertainment - you'll want to stay home all the time!). Moreover, since I started sewing my own clothes, I've gone off shopping as I know that I can always make something that little bit more perfect myself (perfect as in suitable, that is, if not perfect stitching!). So in that sense, it can certainly save you tons of money! "I have no idea how to use a sewing machine. How can I learn?" If you're like me and have no patience with instruction manuals, the best way to learn is to take a class. I started with a one-day workshop in how to use a sewing machine, which drilled me in threading the machine, showed me basic stitches, and taught me to make a simple appliquéd bag. After that, I took a three-day introduction to dressmaking course which taught me how to cut out the fabric pieces, follow a sewing pattern, sew in a zipper, make gathering stitches, set in sleeves, sew buttonholes and other basic techniques. Having a tutor on hand to check I was doing it right and to correct any (many) mistakes was invaluable, and having other beginners around me was really motivating. Have a look for courses at colleges, fashion schools or community centres. And in London at least there are sewing schools (such as Oh Sew Brixton) and craft cafes (such as The Make Lounge in Islington) popping up all over the place (hurrah! ), and even museums are getting in on the act (eg. the Fashion and Textile Museum). Alternatively, if you have a patient seamstress friend or auntie, ask them to sit down with you for a couple of hours to show you the ropes. They'll probably be flattered you asked! Just make sure you schedule in lots of time to practice afterwards so you really get used to the techniques. Once you've mastered the basics, you can learn a lot from books, video tutorials and sewing blogs. 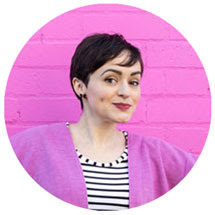 Starting your own sewing blog is highly recommended for documenting your progress, keeping yourself motivated, and becoming part of a community very willing to share hints and tips! "I know how to use a sewing machine to make simple things like cushion covers, but how do I make clothes?" I'd advise you to follow a sewing pattern (see question below for suggestions). You can of course sew clothes without a pattern, by following tutorials in books, by basing your project on an existing item in your wardrobe, or if you're really confident you could just make it up yourself. But personally I think you're best off learning to follow a pattern, as it'll talk you through the standard procedure for putting a garment together and you'll learn new construction techniques along the way. Think of it as a life skill! Interpreting a pattern can seem a bit daunting at first, so the quickest way to learn is to take a class that will help you decipher the instructions (or lack of them). I could show you the back of a pattern and explain how to read it if you want - leave a comment and if there's enough demand I'll go through it in a later post. To sew clothes, you'll need to learn techniques such as forming darts, finishing seams, adding interfacing, inserting a zipper, sewing buttonholes, gathering stitch... You can get these from a book - I constantly refer to Complete Book Of Sewing but again I would recommend a basic sewing course to get you started so you get hands on experience and tutor feedback. "Are there any first projects you could recommend to get me started?" If you've never sewn anything before, I'd begin with a simple tote bag. This will give you practice in straight stitching and hemming, and you can have fun decorating it afterwards! For a first clothes project, I'd start with an A-line skirt or shift dress, with simple lines, a minimum number of pieces and no fancy techniques. When choosing a pattern, think about what you are ready to tackle. Zips? Buttonholes? Pleats? Gathering? You might also want to consider whether you can see yourself making up the same pattern a few times. Once you've completed your first garment, it's worth going through it again to remind yourself what you learnt. My first clothes project was McCalls 2401, which taught me darts, zips, hems, sleeves and facings. Pyjama bottoms would also be a good first project to ease you in, or maybe a smock-style top, or even just an apron. You also need to consider what fabric to use for your first project. Don't choose anything that's even vaguely slippery or liable to run, otherwise you'll be put off for life! A light- to medium-weight cotton would be good as it will lie flat, press well and won't slide around on the machine. There are a lot of gorgeous cottons around that are designed to be used for quilting and craft projects, and there seem to be two schools of thought on whether you can use them to sew apparel. Some people will be adamant that you can't use them for clothes as they are too stiff and don't drape nicely. In the other camp, some people say that you can use them for some projects that don't require flowing fabrics - such as an A-line skirt. This may all seem confusing, and choosing fabrics isn't my forte, but the back of the pattern will suggest some fabrics to use and you can always take your pattern into a fabric shop and find a friendly assistant to advise you. Now read Learning to sew - Part 2!